The 'mandala' is a powerful spiritual symbol from early civilisation that is prevalent throughout history in spiritual practices that honour the mystic life force- from creation to dissolution. In Tibetan Buddhism we find delicate vibrant sand mandalas representing the sacred realm of existence of buddha. In the Hindu tradition there a myriad of temples and yantras in geometric formations with layered triangles which represent creativity ( shakti) and knowledge ( jhana/vidya) ). These magic circles are central to Tantric rites, philosophy & art - embodying a deep connection to nature as divine manifestation perfect as it is. 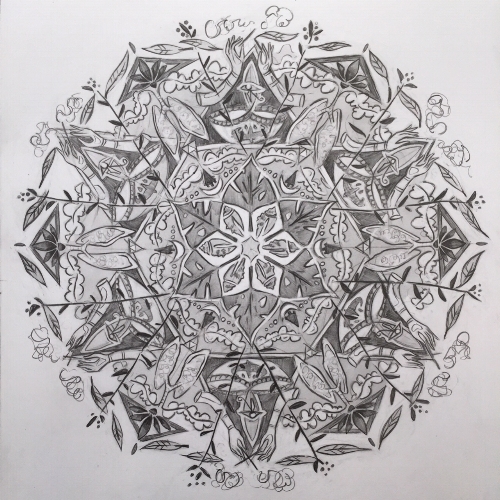 The making of the mandala can be and is for many a profound spiritual practice that connects us to the source of being. It is also an extremely relaxing and healing process that we can get lost in without pressure of a final outcome as we enjoy the meditation of simply creating. Why is this a spiritual practice? Well spirituality can mean a lot of things to many different people but perhaps we can we can define it as an activity that involves a process of contemplation & self reflection that helps us grow by realising the innate connection between man and the divine. Infact between every creature and the divine- divine manifestation. A spiritual practice helps us find and navigate our way through this world and into our own centre. Tantra aims to transform every action in life into a ritual so the individual performs every action and thought with a feeling of worship and awareness. The term mandala comes from the root 'Mandra' translating as essence and 'La' translating as container. Other common translations of mandala are ‘circle’ or ’whole’. and often a circle is what a mandala looks like. This reflects our spiritual path as being one that is circular in its evolution, such as the cyclical process of undertaking a specific sadhana for a period of time. Mandala’s often denote a ritual space- providing a point of focus for gatherings of people and/or intentions and may be created as an alter. So when we have this little piece of information can see past pretty repetitive patterning (though this is a beautiful aspect of the mandala) and into the multiple ways that we can interpret and find natural mandalas all around us all the time. From the iris of your eye to a multi petalled, layered flower blossoming, the sustaining orb of our planet or the fiery sun to the cycle of the breath to the unit of our family circle our world is rich with mandalas and this is way the process of making them is such a relaxing and healing form of meditation. The mandala is not simply a representation of cosmic energy - it is cosmic energy itself. For a vinyasa yoga practitioner as many of us are today , exploring the mandala can be a profound aspect and revelation of our spiritual practice- bringing the everyday into the realm of the holy. Both mandala and vinyasa are at their essence about the process of moment to moment conscious placement. In relatable terms nyasa as honouring the self through anointing sacred body centres with mantra, visualisation and touch and the prefix vi meaning consciously. In this cycle of special placement within the cyclical flow our actions and reactions ( karma) the unfolding of the sequence (krama) infuse in a whole united experience of the self ( yogam). The making of and ritual that surround the formation of a mandala creates and honours this 'container of essence' that is a cosmic representation of the universe, our planet, our sacred body and breath in its non- dual wholeness. Everything is a manifestation of Shakti energy in the mandala creation and an expression of Siva, underlying consciousness. From the macrocosm to the microcosm and back again, infinitely. Here I would love to share a simple way to get into mandala making for your own joy and benefit. 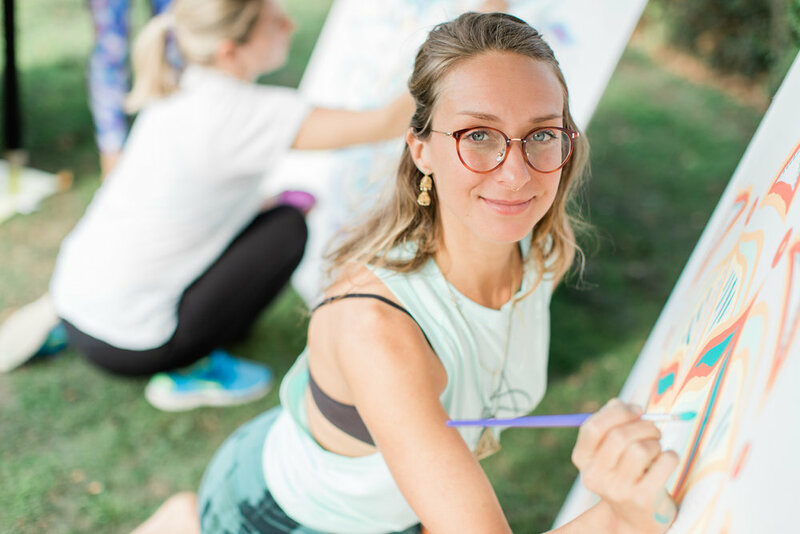 This the practice similar to the one I shared at Wanderlust 108 in September 2018 and it was simply incredible and humbling to be with so many of you in this process- thank you! Equipment: a foundation like paper or if you are lucky enough to be by the sea - damp sand, drawing tools or a ready steady finger. The mandala evolves from a centre point, a bindu , representing the cosmic seed of vibration (aum) or the navel centre ( creation) and the design that grows out of this point in mediative layers of repetition; the vibrant outward pulsation & evolution of the universe in infinity. One mark evolves the next in an unbroken flow or action and reaction. What is amazing about this process and why I love it so much is that it spontaneous concentration practice that allows us to enter a flow state. In this space time really has no hold and you can become fully absorbed in the activity. So to help us find our focus, connect to our centre point and one another- let us start with the breath. Let us find chin mudra bringing the tip of the index finger to the tip of the thumb in a delicate touch- as if holding sutra ( thread) of light between your finger tips. That sutra is so fine, as if it was the thread of your existence, of your life’s breath. That thread travels from your left fingers up through your left nostril down through your right nostril to your right finger tips in one unbroken circle like a mala string. Become aware of the breath moving around the rim of the nostrils. Become aware of the breath moving in the nose. Feel its texture, temperature-notice its length. Hover your awareness there for sometime as you start to relax. Let the mind come to rest in the breath. Can you allow the each breath expand to maybe 5 counts in and 5 counts out or lengthen to 6 fi you can, without force. Simultaneously can you feel and maintain awareness of the thumb finger and micro space between- chin mudra. Visualise that the breath is pulsing in that thread. Exhale completely. Now as you breathe in feel the breath rising from the right fingertips into the right nostril to its apex point behind the eyebrow centre. Exhale following the breath out of the left nostril and back to the left fingertips. Repeat this even cycle flowing from the left to the right, same count inhale and exhale for a few rounds. Nadi Shodhana Pranayam. At the bottom of each exhale when the body is empty of breath your awareness is in the mudra. At the peak of the inhale the awareness is gently spread at the third eye centre. Have a sense that you are ‘flossing’ the nose with the sutra of the breath- Sutra Neti. Once this stage is flowing naturally add in a 5 count inwards retention at the top of your inhale. When this is comfortably established add in a 5 count suspension of the breath at the bottom of your exhale ( or whatever count you are working with). Continue for some time and when you are ready release the pranayama and the gesture. Give yourself space to feel and digest the practice. Psychic Nadi Shodhana with Sutra Neti visualisation and Kumbaka. I hope you enjoy these practices and posts!